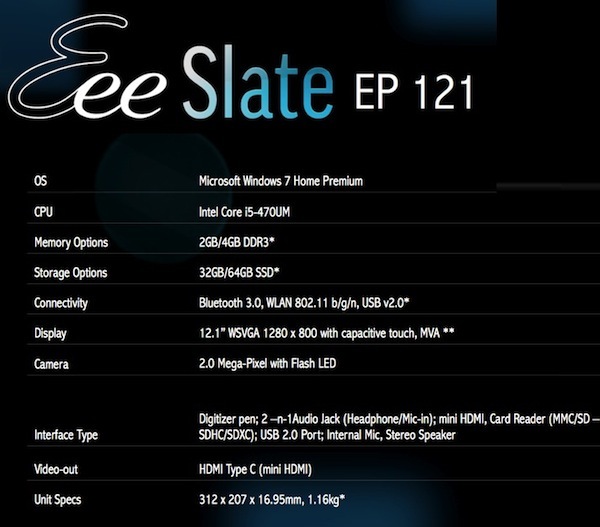 ASUS' powerful 12-inch Eee Slate EP121 tablet has been no secret -- don't forget, it was teased at Computex and then sketched on a digital blackboard -- but here it is, with final specs and pricing information. Unlike ASUS' trio of Android tablets, the EP121 is all about Windows 7, and oh does it have the guts to run it smoothly -- it's powered by a Core i5-470UM processor, packs 2 to 4GB of RAM, and a 64GB SSD. It sure has the internal muscle to compete, but it also has a high-resolution (1280 x 800) 12.1-inch IPS capacitive display with a Wacom digitizer. The latter will allow you to use the included stylus to draw self-portraits or you know, take notes in class. ASUS maintains that the tablet breeds entertainment with enterprise, but something tells us the front-facing camera and HDMI port will have this one in the living room more than the board room. ASUS says the EP121 should be hitting sometime in the first quarter of the year for around $1,100, but expect us to bring you hands-on impressions way before that. Hit the break for the full specs. Update: ASUS says it'll actually start at $1,000, with an upgraded model available for an extra Benjamin, and it's due out later this month!